The BHS Forklift Work Platform (FWP) securely attaches to a forklift to elevate an individual for overhead maintenance tasks, such as changing light bulbs and conducting inventory. The platform attaches firmly to lift truck forks and a Fork Tine Restraint locks securely. 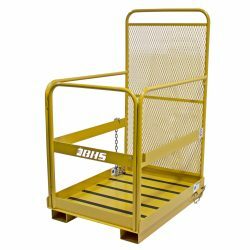 Other safety features include a 42-inch-high guard railing that keeps workers safely contained on the platform, a 4-inch toe guard to prevent tools from falling, and an expanded-metal mast guard for optimal visibility. Safety harnesses can be attached at multiple points. The FWP is finished with a “Safety-Yellow” powder coating, allowing staff to easily see it from the ground. The Platform Deck includes an anti-skid surface, while a Hook-and-Chain mast restraint provides another layer of protection. This all-steel attachment complies with or exceeds federal safety regulations for vehicle-mounted elevated platforms. Download a detailed PDF from the top of this page to see all of the FWP’s features and benefits. Contact our sales team at 1.800.BHS.9500 to find out more about the FWP or to find a BHS dealer near you.